Find My Workspace lists over 95% of the executive office suites market in Arlington (Virginia). Simply click Request Quote to check pricing for one office, or Add to Basket for multiple offices. 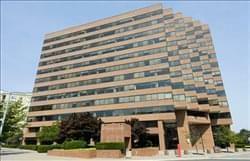 These exceptionally well equipped and premium new office suites are set within a fantastic corporate business center which is in DC’s main technological innovation hub, so come meet your new corporate neighbors in media, technology and Fortune 500 companies to set your business up for endless opportunity and networking possibilities. Along with those significant professional benefits and the customary perks of the area, prospective tenants will see the world famous Washington Monument from across the Potomac River. The site itself offers such excellent facilities and provisions as high speed internet connections, spacious meeting rooms and conferencing space. This center is one that you cannot miss. With the amenities and features you will not want to leave. This center provides live answering with dedicated numbers to you and you can access voicemail remotely. You will have full support from the staff members, and 24/7 hours access to your office. There are several conference rooms to be used for collaboration and large size offices with great windows for natural light. You have access to furniture packages making for an easy move in and move out, no hassle. And one of the best features, to save for last is the Fitness center, POOL, and SAUNA access from your office! Arlington, Arlington (Virginia) - Wilson Blvd. This center has a very elegant appeal with fantastic private offices. The conference rooms and private phone booths are perfect for a private and focused work space. There is a cafe on-site making it quick and easy for a busy day. The center has gourmet breakfast, craft coffee, healthy snacks wine tasting events and happy hours. This is the perfect combination of work and play. The offices range in size from 120-560SF and are fully furnished. Professional staff with full reception service is available Monday thru Friday 8:30am to 5:00 pm. Kitchen service and conference room usage is also available. This creative and highly collaborative work space venue is the perfect place for those who want a slightly more relaxed yet highly focused and creative working environment. Offering extensive private office space as well as shared and co-working areas, this business center offers every option you could think of and is able to cater for any corporate requirement with ease. With modern design this center fuels innovative thinking with its social and empowering atmosphere. There are also meeting rooms and kitchen areas for you to use with a plentiful supply of tea and coffee to keep you working at your optimum. Any prospective business tenant in search of premium, professional and exquisitely supplied workspace solutions would be ideally suited to locating company offices at this fantastic site in the exciting Arlington neighborhood of Clarendon. Occupants can enjoy and benefit from the location’s very close proximity to numerous Fortune 500 companies, global nonprofit organizations and federal agencies as well as some of the best dining and entertainment establishments in all of NOVA. Located merely one block from the metro and a quick commute to Washington Reagan Airport our location is perfect for the frequent traveller. To obtain information for your selected Arlington (Virginia) Executive Office Suites, please tick the "Add to basket" box for each office you prefer and complete the form below. We will then send a detailed report via email.